The other day I had an opportunity to check out Trader Joe’s gluten free mixes. I had stopped by the local Trader Joe’s to pick up a few loaves of gluten free bread to test for a future post about all types of gluten free bread. While I was walking through the store, I noticed a few gluten free mixes including a gluten free pumpkin bread and muffin baking mix. I also saw their gluten free chocolate chip brownie mix and their gluten free buttermilk pancakes and waffle mix, so I decided to get them all. The best part about mixes, as opposed to baking from scratch, is how easy they are. You usually only have to add a few ingredients and those ingredients are usually things you already have on hand. They get bonus points from me if they are dump and go. This means you can just dump all the ingredients into one bowl and mix with no extra steps like separating egg yolks or mixing separate ingredients in separate bowls. That just leaves me with a big mess which defeats the purpose of using a mix. 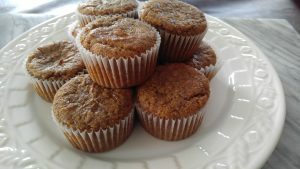 I was very excited about the pumpkin muffins because I’ve never tried that flavor and I thought they would be a good addition to our Thanksgiving dinner. The brownie mix was a good idea because it’s always important to have a backup brownie mix ready to go in case your usual mix (ours is Aldi’s Gluten Free Chocolate Baking Mix) is out of stock. 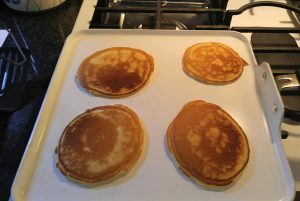 I was excited about the gluten free buttermilk pancake mix because my son really likes pancakes and I’m always looking for a better gluten free pancake mix. I liked the instructions on these muffins. They were very simple, basically, dump and go. 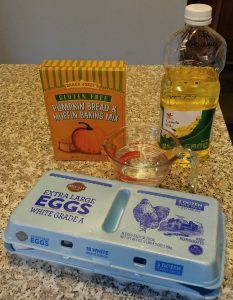 I especially liked that there was no butter to soften or melt, just the mix, water, oil, and eggs. I decided to make muffins. That’s what I usually do so that if I freeze any, I can take out just what I need. As soon as I opened the bag of mix I could smell the cinnamon of Fall, yum! I’m not an expert on dairy, but the ingredients listed look to be dairy free. Unfortunately, the allergen statement says the mix may contain traces of milk, egg, and soy. It also says on the box that it makes 12 large muffins. I was able to make about 16 regular sized muffins. Unfortunately, these muffins did not live up to the expectations of my family. I think part of the problem was that they were not cooked enough. I did cook them the maximum amount of time in the oven as stated on the box and the toothpick came out clean but they still sank in the middle after they cooled and the texture was mushy. Finally, the taste was pretty strong and the more bland palates in the family really did NOT like it. If I buy them again, I will definitely disregard the box and cook them for an extra 5 minutes or more. This mix was a huge hit. They were super easy! Not quite dump and go, but all I needed to add was oil, 1 egg, and water. 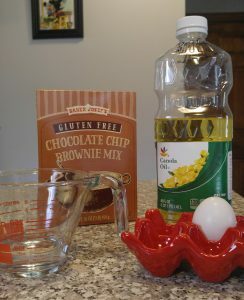 The mix was added last after whisking the other ingredients together. As a bonus, I didn’t have to add any extra chocolate chips, like I usually do, because they were already in there. The ingredients in these brownies also seem dairy free (remember, NOT a dairy expert here) but again, these have an allergen statement stating they may contain traces of dairy. So, use at your own risk. I served them at my dad’s birthday (along with birthday cupcakes, of course) and everyone liked them. They were fudgy with just enough chewiness. I even saw a few people sneaking seconds. Unfortunately, they were all gone before I was able to take a picture. 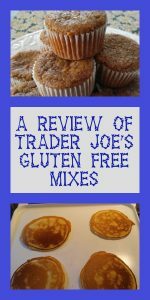 The last of Trader Joe’s gluten free mixes, that I tried, was the Gluten Free Buttermilk Pancake and Waffle Mix. It was another dump and go mix but I didn’t need to dirty the Kitchen Aid mixer this time. I needed to add just egg, water, and butter. Obviously, this meant it was not dairy free. 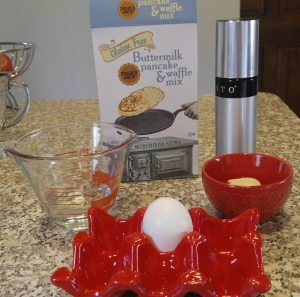 Since the mix also contained milk, substituting oil for the butter would not help. This mix was the biggest hit out of the three. I only made one batch so that if I messed up, I could repeat it. The one batch made about 8 small pancakes. It would have probably made about 6 large ones, but I find that the larger ones don’t cook as evenly and end up mushy inside. The mixture was easy to mix by hand with my flat whisk. I never use a regular whisk for pancakes or waffles because all of the dry mix usually gets stuck in the middle of the whisk and I find that extremely frustrating. These pancakes were a huge hit. Everyone thought they were the best they’d ever had. We were very scientific. We tried them plain, with just butter, with just syrup and with both butter and syrup. They were delicious every way, even plain. 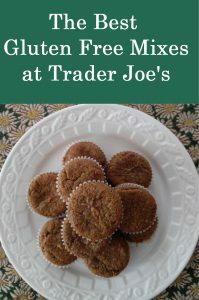 All the Trader Joe’s gluten free mixes were inexpensive relative to the big name gluten free brands. That’s a huge plus to someone like me who has two teenage boys and a husband who all have to eat gluten free. Overall, I find Trader Joe’s to be very friendly to people who must eat gluten free. Occasionally, they have supply problems and may have trouble keeping something in stock. I find that it’s usually caused by something being too popular or the supply company being taken off guard at the requirements for keeping all Trader Joe’s stores stocked up. The plan for my next trip is to pick up a bag of Trader Joe’s gluten free flour that I spotted on the shelf this time around but didn’t have time to test. I’ll have to see how it stacks up to my usual Bob’s Redmill 1 to 1 flour. 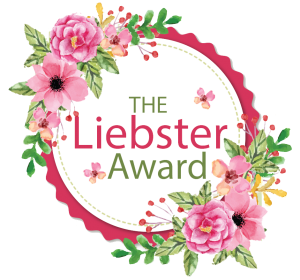 Do you have any other gluten free products you’d like me to review before you buy them? I’ve always wondered about these. Thanks for sharing your findings! I’m excited to try the pancakes. They look delicious! The pancakes really were very good. I hope you enjoy them! Some exciting and interesting ideas. Will definitely try them out.